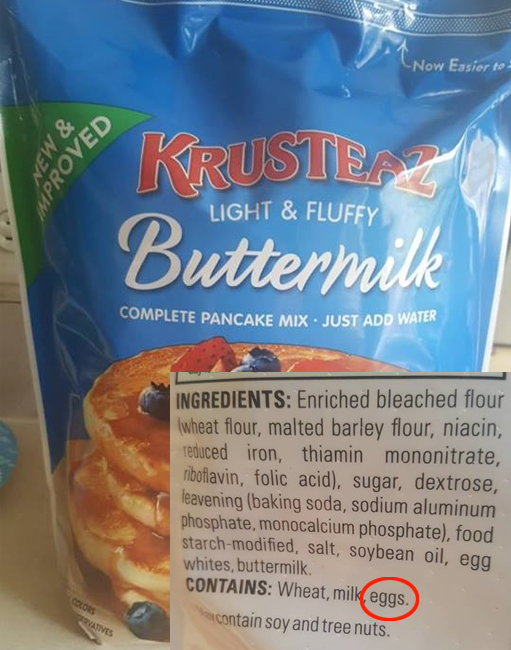 Krusteaz Light & Fluffy Buttermilk Complete Pancake Mix now contains egg ingredients. There is a green flag in the corner that says "New & Improved." Please check your pantry if you use this product. Need a replacement? Tr our favorite Egg-Free Milk-Free Pancake recipe from our Safe Eats recipe collection. Thank you to community member AAA for alerting Kids With Food Allergies of this change. Contact us if you find a product change that adds a major allergen. It is important to stay up-to-date on news and food allergy recalls. By joining our community and following our blog, you will receive important updates about food recalls and other food allergy news.